I had the opportunity to review Lubricated, Live and Loud by Crankshaft and it's a crap kickin' great time. Opening with Crankshaft, the concert is off with a huge bang. This is stripped down blues with today's edge at it's best. It's raw, it's edgy and it's real. This is not tapping and hammer ons and pull offs. This is loud and distorted and gut wrenching. Junkyard Rhythm is uptempo and spontaneous. There's no custom shop Stratocaster or Dumble amps here! This is right out of the box. An updated version of Robert Johnson's Terraplane Blues is included giving Crankshaft one of many opportunities to get his slide in order. Nail Driver finds Crankshaft using the minimum of instrumentation with his vocals, keeping the groove with nice guitar riffs. One of my favorite tracks on the release is Nasty, a very loose boogie track. The guitar sounds like it is detuned to a lower octave and the sound is almost rubbery... this is really great... the kind of track that is sure to create a frenzy in an audience. 327 is a more straight forward blues track... I mean this is as simple as contemporary electric blues gets... perfect! Solid Gone is another boogie track that keeps the listener engaged. 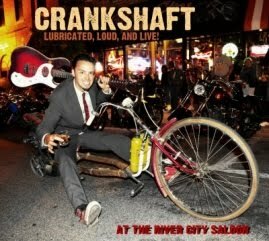 Crankshaft has a great blend of lyrics, rhythm, flash and raw. Neighbor Boys is another great track and generally has the sound of an early Bob Dylan track but with kazoo substituted for harmonica. Jestures track Cadillac Man shows strong compositional skills as well and this time featuring Jay Walters on harmonica. Boogie is a great party track and keeps you wanting more and more. Run Chicken Run is really a rock and roll take on a surf song from the country.... top that! This is a really super live recording and one that I can highly recommend! Can't wait to see what Crankshaft has brewing for us next.